'A Beautiful Little Girl': Victims Of Manchester Bombing Remembered : The Two-Way At least 22 victims died in the attack at an Ariana Grande concert. The victims include an 8-year-old girl, an 18-year-old student and several parents killed as they waited to pick up their children. 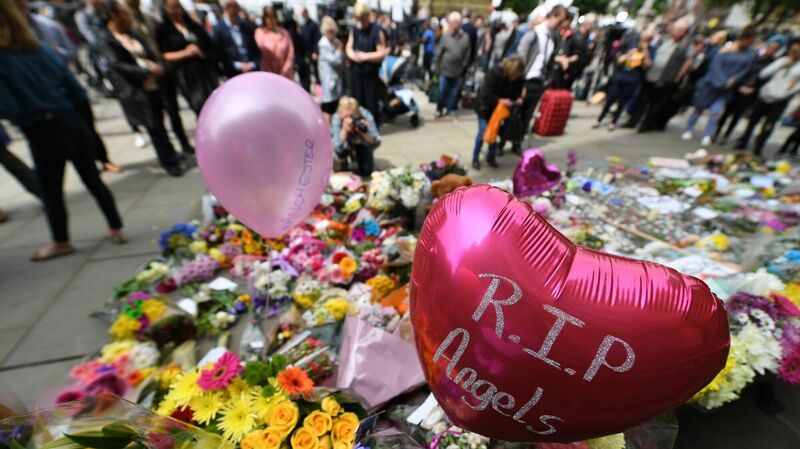 Balloons and flowers filled a memorial in Albert Square in central Manchester, in northwest England, in tribute to the victims of the Monday night attack at the Manchester Arena. The Manchester Arena was packed on Monday night with pop fans eager to hear Ariana Grande perform. Her songs are bubblegum pop, so picture the crowd: kids and their parents, teenagers with their friends, fans looking for a cheerful night out. At the end of the concert, an explosion struck near the arena. The blast killed at least 22 people and injured more than 50. Young women — including very young girls — are Grande's core fan base. And authorities confirmed that children were among the dead, which was quickly apparent as friends, family and schools began reporting the names of some of those victims. The first to be named was an 18-year-old woman. The second, an 8-year-old girl. Saffie Rose Roussos, the 8-year-old, was attending the concert with her mother and sister, The Guardian reports. Saffie was initially identified as missing after the attack. Her photo was circulated online by friends of the family who knew that Saffie's mother and sister had been hospitalized, but couldn't find Saffie, according to Metro. Now her death has been confirmed by the headmaster of her school, Chris Upton, who told the Guardian Saffie was "simply a beautiful little girl in every aspect of the word. She was loved by everyone and her warmth and kindness will be remembered fondly." An 18-year-old college student, Georgina Callander, was also named as a victim. Callander was studying health and social care at Runshaw College, which confirmed her death on Facebook. Callander had a buoyant social media presence, celebrating the singers, actors and shows that she followed passionately, and rejoicing over school achievements like finishing a long paper. She often sought photos with celebrities — in fact, took a picture with Ariana Grande two years ago. Her caption read in part, "I HUGGED HER SO TIGHT AND SHE SAID SHE LOVED MY BOW." On Sunday, she tweeted at Grande, "SO EXCITED TO SEE YOU TOMORROW." A 14-year-old named Nell Jones died in the attack, the BBC reports. One of her classmates reportedly spent 10 hours in surgery but was said to be in stable condition in the hospital. Olivia Campbell, 15, was killed in the attack, her mother confirmed on Facebook. Charlotte Campbell, Olivia's mother, had made an emotional appeal on Good Morning Britain when her daughter was missing, before she knew that she had died. "We can't get through to her," Charlotte Campbell said. "I've called the hospitals, I've called all the hotels where people say that children have been taken and I've called the police. ... There's no news and I've just got to wait. I'm waiting at home just in case she turns up here." She pleaded with viewers for anyone who saw Olivia to lend her a phone. "She knows my number," she said. The call left one of the TV hosts in tears, struggling to hold it together on live TV. Fourteen-year-old Sorrell Leczkowski was attending the concert with her mother and grandmother. Sorrell died, her family told the Telegraph, while her grandmother is unconscious after a 15-hour operation. A 32-year-old woman named Kelly Brewster died in the blast — with her body partially shielding her sister and 11-year-old niece from the shrapnel, The Star reports. Her surviving family members are being treated in the hospital. Several parents were killed as they waited to pick up their children from the concert. Two friends — Alison Howe, 45, and Lisa Lees, 47 — were killed as they waited for their daughters, the BBC reports, adding that Howe's stepson called her "a caring beautiful mum" on Facebook. Jane Tweddle-Taylor, 51, a school receptionist, was at the arena with a friend to pick up the friend's daughter, the BBC says. And Marcin and Angelika Klis were picking up their daughters. Michelle Kiss, 45, was killed in the bombing, Express reports. Her daughter was photographed in the aftermath of the blast, wrapped in an oversized coat and being comforted by a policewoman. A 29-year-old man who repeatedly appeared on British TV and charmed Twitter users by promoting his mom's crafts also died in the blast. Martyn Hett was a PR manager who had won a British TV competition where people vie to host the best dinner party, and also appeared on a tattoo-themed reality show. His boyfriend tweeted that "our wonderful, iconic and beautiful Martyn didn't survive," the Telegraph reports. Another victim has been identified as John Atkinson, according to the Manchester Evening News. His age has been reported as 26 and 28. Friends called him "a beautiful soul" and "an amazing young man," the newspaper reports. Greater Manchester Police say they believe they have identified all the victims and notified all their families, but they have not yet released a full list of names. GoFundMe has created a hub for fundraisers on the victims' behalf. Meanwhile the dark side of the Internet has also made an appearance: Trolls have created fake victims and attempted to rally support for them as a hoax.